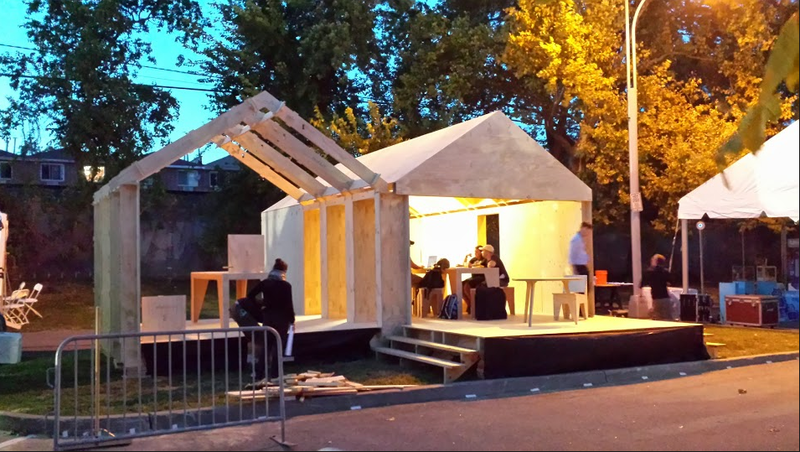 This Fall 2013, a team comprised of software engineers and designers from Colorado and Massachusetts, architects from the UK, and some ShopBotting digital fabbers from Virginia got together and built a house. In two days. Thousands of Maker Faire-ians walked around inside it and checked it out, and learned about the easy-to-use software employed to design the house — up to 50 or 60 people at a time — and they were suitably amazed at how a structure built with almost NO screws, and no nails at all, would be so simple, elegant and sturdy! And then when the Faire was over, the team took down the house… ready to be put up again. 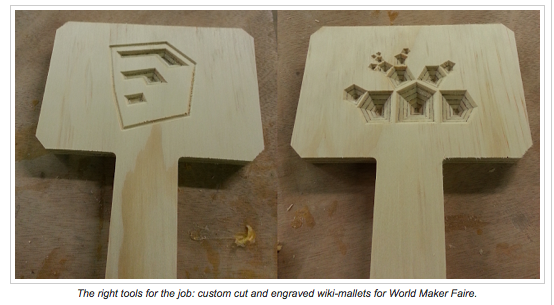 So what’s a Wikihouse? Based in the UK, the Wikihouse is an open source construction set. Its aim is allow anyone to design, download and ‘print’ CNC-milled plywood houses and components, which can be assembled with minimal formal skill or training. 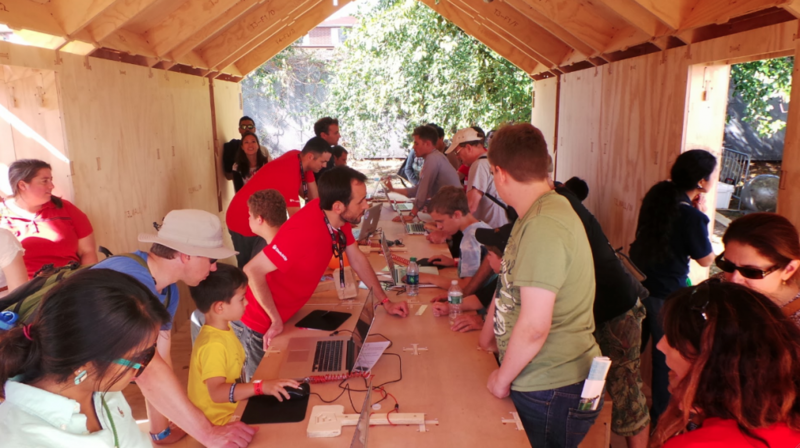 WikiHouse is a non-profit project, developing hardware and software which is open and shared in the commons, owned by everyone. The NYC Faire project was conceived during the San Mateo Maker Faire this past spring, when software engineers from Sketchup (John Bacus, Mark Harrison and others) got together with Wikihouse architects Alastair Parvin and Nick Ierodiaconou to hatch a plan for the “next big thing,” which turned out to be making the digital model of Wikihouse real in NYC. ShopBot’s Bill Young and digital fabber/builder Robert Bridges contributed their expertise as builders to further inform the design and advise the team about appropriate materials for construction. Bill Young cut out 1150 parts out of 160 sheets of plywood in preparation for the build…including the mallets that would be used to put together the house. Inside the Wikihouse, Maker Faire attendees of all ages learn about the Wikihouse project and the Sketchup software. 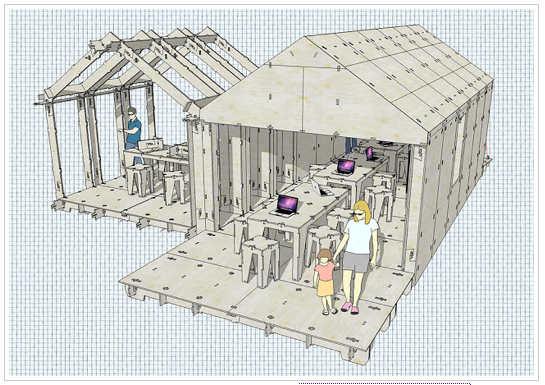 The plans for the Wikihouse are now available online. Click here for the link. Another important aspect of the Wikihouse is that it’s a “hackable house” — it’s relatively easy to go in and take apart sections of the home to reconfigure/remodel areas of the home to meet the residents’ evolving needs. 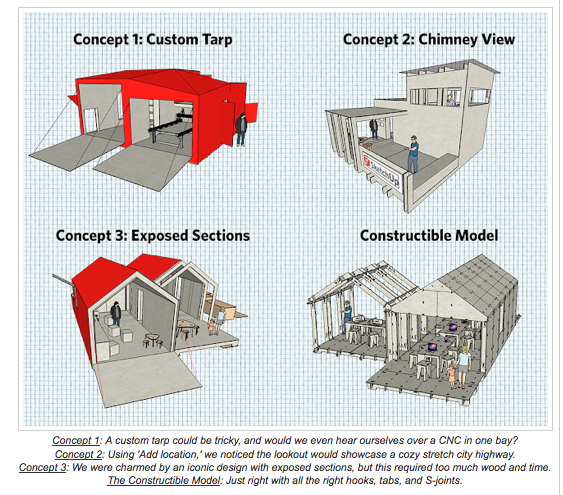 “As a kitchen and bath designer,” says Eric Schimelpfenig, “this is yet another exciting feature of Wikihouse design. It brings down barriers to making changes to a home — the expense and the complication of a remodel can be lessened considerably.” You can learn more about Eric’s development of easy-to-use kitchen and bath design tools here. Looking to the future, communities of people who are interested in fostering sustainability could be well served by incorporating “Wiki-building.” You could imagine a group of people buying some land to develop, designing unique and interesting homes — and even sharing their CNC tools and various expertise.. A sort of 21st century “barn raising” applied to home building. WATCH the time-lapse video of the house going up…. filling up with the visitors…. and then being deconstructed! 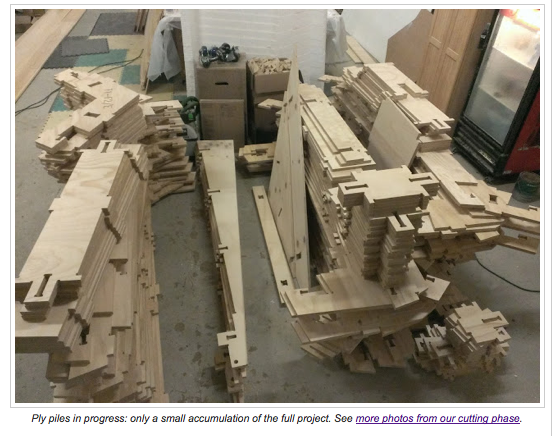 Want to learn more about the inspiration for the Wikihouse project? 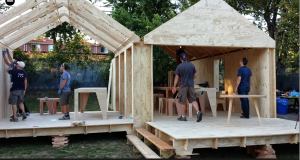 Watch this fascinating TED talk by Wikihouse co-founder Alastair Parvin.